Note:- This range is not compatible with UK designed storage systems. Large profile. Rope operated, with or without Jack-beam & handling poles. Small profile. Push up with manual pawls. Stick Ladders. Connect-able + other attachments. Hook Ladders. Straight & Curved hook. 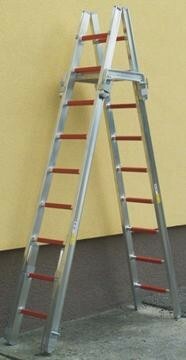 Multi Purpose ladders. 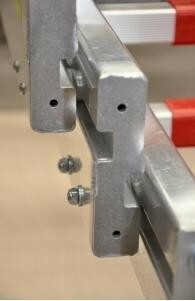 Folding push up with fittings. 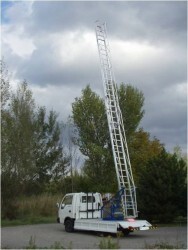 Rotating Long Ladders, Type 66:Trailer or truck mounted:- 9mtr to 24mtr. The European "EN" range is very similarly shaped to the BSEN profile. 3 Person Rescue, Secures together by locking catches. 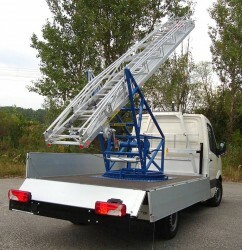 Long Ladders: Trailer or Vehicle mounted. 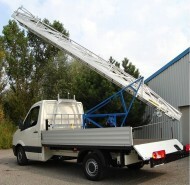 Long ladders are available either mounted onto a Trailer or LGV. In length's 9mtr to 24mtr. For the full list and details of available ladders, please contact.